This log furniture masterpiece Aspen log bed has only the most unique logs hand picked to ensure your one of a kind look. The aspen logs are hand-peeled to preserve the natural wood color and character to give each log a unique look. To ensure strength, the assembly technique used is mortise and tenon, ensuring heirloom quality craftsmanship. To bring out the natural beauty of the wood, a clear semi-gloss laquer is applied to the bed. 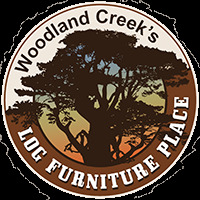 Each piece of furniture from the Aspen Lodge line is custom made so log sizes may vary.